We are all getting excited for this year's Professional Patroller Conference and we think you should be excited too! Bear Valley is a unique mountain in the Sierra Nevada's just two hours east of Stockton! The resort closes to the public on April 21st, and they are kind enough to let us rent out the hill for the full 5-days. This means we get a private resort experience! If you haven's been to Bear Valley, this is a must do Clinic! It is truly a hidden Gem! They have gotten a total of 442" of snow this season and we should have great conditions! Lift tickets are only $15 per day or a 5-day pass for $60 for a 5-day pass! 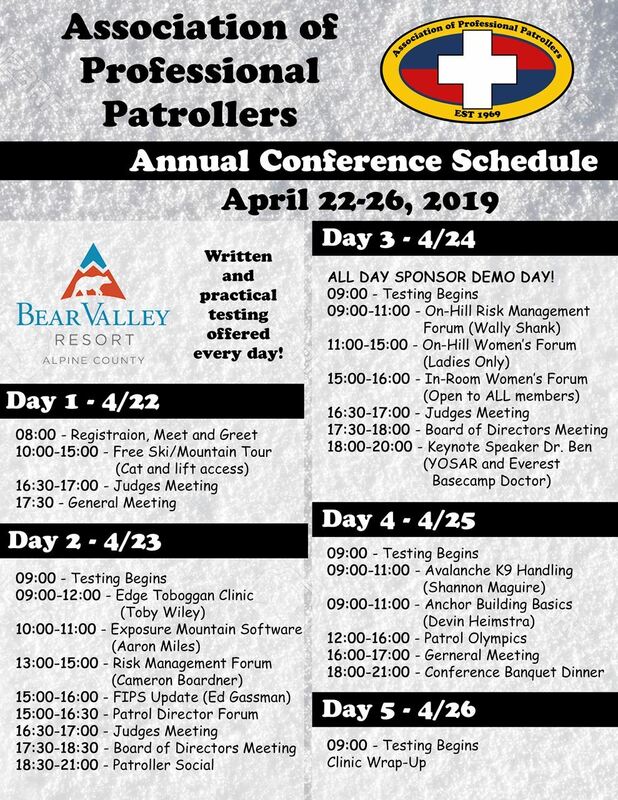 Top 5 reasons to attend the 2019 Association of Professional Patrollers' Annual Conference:Find Out Here! 2. Click the “BOOK ONLINE” button. 3. Click the "Do you have a group code?"